Submerged mines were once the scourge of sea warfare, silently lurking in bays and channels to blow a hole in your hull. That's why the US military has developed a trident countermeasure, hunting for the underwater bombs from below the waves, along the surface, and from the air using the biggest bird in the Navy's arsenal, the MH-53E Sea Dragon. Built by famed defense contractor Sikorsky, the Sea Dragon is derived from the equally mammoth CH-53E Super Stallion but features a larger fuel capacity than the Marine version. It's been in service since 1986, with orders to continue until at least 2017. The Sea Dragon measures nearly 100 feet in total length and is 28 feet tall with a 79 foot rotor diameter. A trio of GE 4,380 shp turboshaft engines provide the necessary power to lift 55 troops or 32,000 pounds of cargo as far as 1050 nautical miles. While the Super Stallion is outfitted with a large cache of weaponry for airborne assaults, the Sea Dragon is instead primarily employed in long range demining operations, Airborne Mine Countermeasures (AMCM). 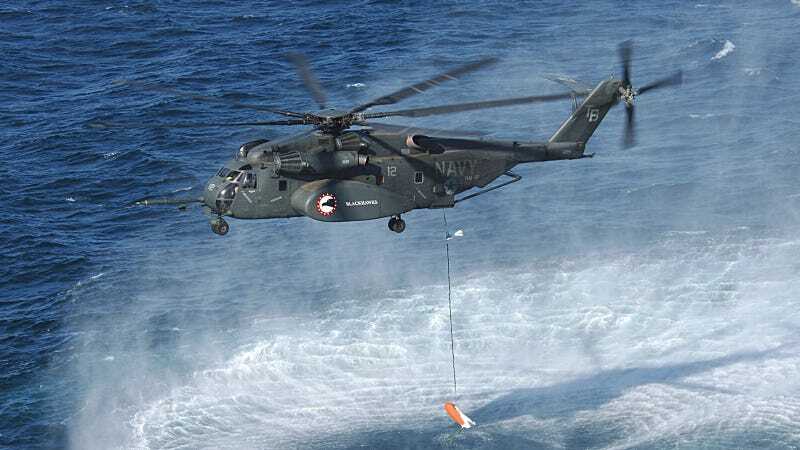 As such, the helicopter carries a variety of mine-sweeping systems such as magnetic minesweeping sleds, mechanical minesweepers, side-scan sonar, GPS, and Doppler radar. The Sea Dragon's digital flight-control system is designed specifically to keep the chopper stable as it's dragging a sled through mine-filled waters. That's not to say it's completely defenseless, the Sea Dragon can be fitted with a .50-cal GAU-21 machine gun for its secondary assault support missions and includes a pair of machine gun mine countermeasures. While recent upgrades such as night vision systems and forward looking infrared (FLIR) will extend the Sea Dragon's effective operational lifetime, both it and the Super Stallion may soon be replaced by an even more monstrous flying machine, the Sikorsky CH-53K.